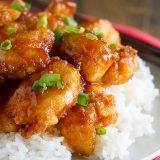 Skip the take out – this Sweet and Sour Chicken Recipe is so good that you’ll put it on the permanent rotation. Chicken is coated in a sweet and sticky sauce and baked to perfection. Cut the chicken into bite-sized chunks. Season with salt and pepper. Put the cornstarch in a shallow bowl. Put the eggs in a separate bowl. Place the oil in a large skillet and heat over medium-high heat. Working in batches, dredge the chicken in the cornstarch, then dip in the egg. Add to the hot oil and brown on all sides. You do not need to cook the chicken through, just brown the outside to get a crispy exterior. Transfer the chicken to a 9×13-inch baking dish and continue with the remaining chicken. In a bowl, combine the sugar, ketchup, cider vinegar, soy sauce and garlic powder. Pour the sauce over the top of the chicken. Bake the chicken for 1 hour, stirring every 15 minutes. Serve over prepared rice.